Dale Natoli investigates the complexities of deciding on tablet shape. Why that tablet shape? This is a question often asked, especially when researching a solution to a tablet or tooling deficiency directly related to a tablet shape. Most companies do their due diligence when selecting a tablet shape, and some simply only lack the understanding of the importance of tablet shape and its effect on efficiency. An improper tablet shape can cost millions in lost production and sometimes even cause a complete disaster. Some companies design unique tablets hoping to reach an acceptable level of consumer recognition with the objective to maintain customer loyalty; this effort is generally driven by marketing. Tablets are designed considering the end user, such as a 'break-easy' bisect design or a child's three-dimensional animal shaped multivitamin. Tablets are designed for technical application such as watch batteries and automotive airbag igniters, pre-formed desiccants, and so on. However, some companies desire a tablet shape engineered to provide easy and unobstructed production such as a simple standard cup round. Certain tablet shapes simply play havoc with tooling and press wear - adding significant costs to the unit dose. The same is true with packaging, as an incorrect tablet design can chip, clog or provide an improper tablet count related to weight. An error commonly made when considering a tablet shape is replicating and even duplicating a poor design. Unfortunately this happens often within a company's own product portfolio as well as in the attempt to replicate or duplicate an existing tablet that is considered to be a weak and deficient design. One of those happens to be one of the oldest and most common tablet designs - and one that is still used today. This is the Flat Face Bevel Edge configuration, commonly referred to as the FFBE. 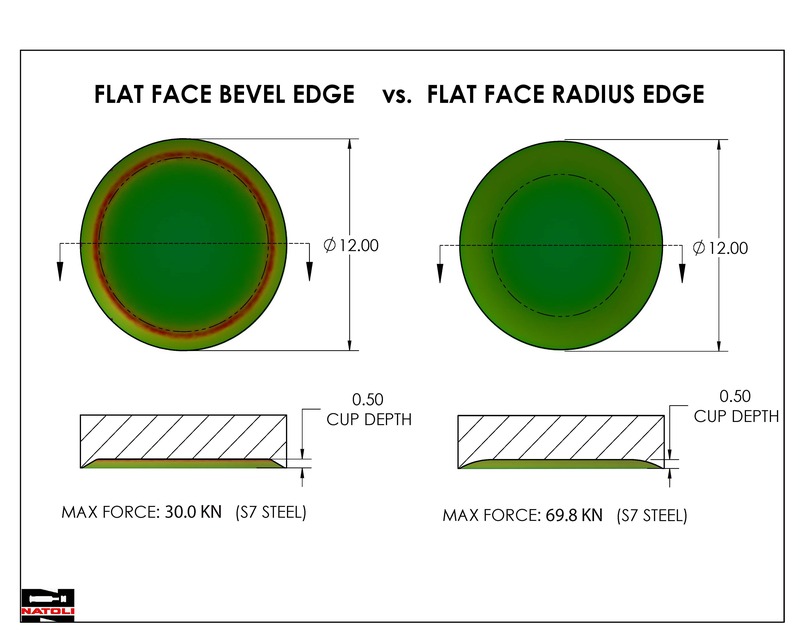 The FFBE was designed as an alternative to the most common Flat Face design. At the onset of commercial tablet manufacturing, the industry sought out ways it could rectify a well-known issue with Flat Faced tablets, which was edge attrition. The problem was created as the flat face tool entered into the compression cycle. 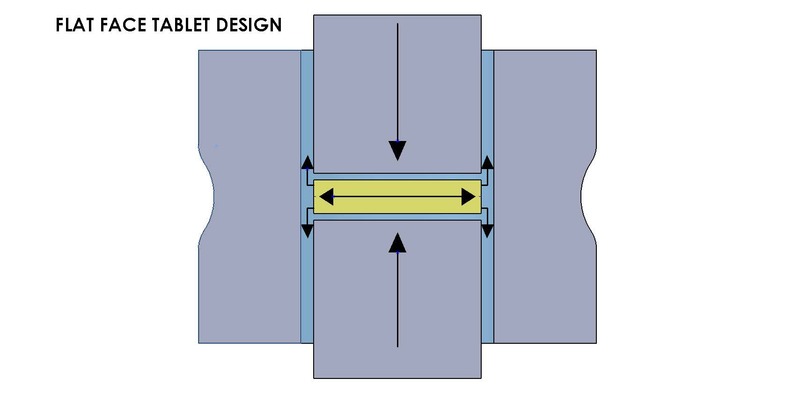 The FF design naturally pushed or forced the powder to the outside perimeter of the punch tip and towards the die wall, which in turn extruded through the punch and die clearance (Fig.1). The FFBE tablet design became common as it helped to deflect or guide the powder back into the tablet, hence reducing soft edges. Although the FFBE design proved to be beneficial for reducing soft edges, it presented a new problem, which was punch tip failure. On an FF punch tip, there was virtually no cup or cup depth of the punch tip: it was simply flat, so there was not a cup limiting compression force, pressure limits were determined by the punch tip size to reduce tip bending and distortion. * The FFRE can accept more pressure than the FFBE due to eliminating the bevel and replacing it with a radius. Doing this allows maximum compression forces in many cases to almost double, allowing more pressure to alleviate conditions such as sticking and picking (Fig.2). * Better uniform tablet hardness as the powder has a natural flow across the radius, which can reduce hot spots and or discolouration to the perimeter of the top of the tablet. * Consumer acceptance as the FFRE tablet has a softer look and is more appealing to the consumer and generally has a better mouth feel. There are enough advantages of the FFRE tablet design over the FFBE design that it should be considered for all new tablet designs for coated and non-coated tablets, hence someday making the FFBE design obsolete. 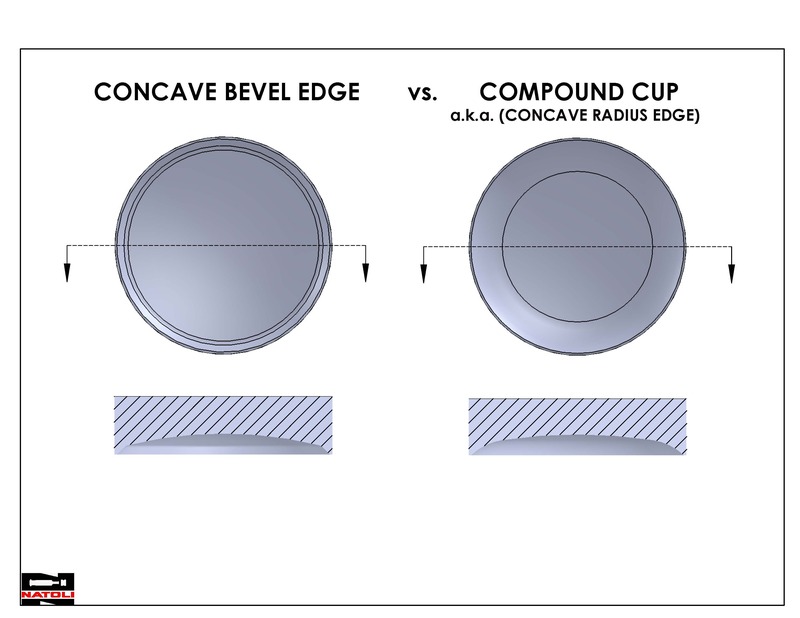 The same holds true with Concave Bevel edge tablets (CCBE) - Fig.3 - commonly used on both round and shaped tablets to assist in reducing edge attrition during the coating process. Again, the radius edge would make a better and more robust design, generally allowing an increase in maximum compression force over the CCBE. Designing tablets can be gratifying and provides a sense of ownership when all goes well. But when things go astray, it becomes anything but gratifying. A final tablet design should consider comments from all departments responsible. Considering comments from all departments will empower all involved and ensure a successful and timely launch - and the enjoyment of an efficient, trouble-free tableting operation. Dale Natoli is president of Natoli Engineering Company Inc, St Charles, MO, USA.